Does WordPress Run Better on Linux? Posted on November 15, 2012 at 10:10 am. Windows Azure is Microsoft’s Cloud Computing platform. At Get on Social we typically recommend Amazon’s Web Services. With Amazon’s EC2 (Elastic Compute Cloud) Web Services, you can launch both Windows and Linux based servers. In our experience, running Linux serves have outperformed Windows Servers. Either a standard Linux configuration with Linux, Apache, MySQL, and PHP (LAMP), or using Nginx as the server, or as a proxy for Apache, seem to outperform Windows by quite a bit. 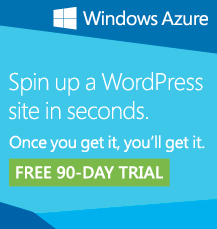 It is understandable that Microsoft is trying to sell Azure around WordPress, since WordPress is the largest, fastest growing platform for websites. The Creative Advantage. Brand Marketing with a 50 Foot Duck.